If you own a residential, a commercial, or industrial property that was built over forty years ago than you may soon be facing some major repairs, particularly to the sewer system. The pipeline that carries raw sewage and wastewater away from your building and into the city’s main sewer line or a septic tank buried on the property was manufactured out of materials that simply do not stand the test of time. Cast iron pipes tend to rust and eventually corrode, and clay tile pipes chip, crack and break when exposed to underground conditions for prolonged periods. When the sewer pipeline is damaged or broken a few unwanted developments begin to occur. The raw sewage and wastewater cannot flow properly through the pipes. Instead, it leaks directly into the ground causing environmental hazards, and or backs up into the pipeline. When the raw sewage and wastewater backs up into the pipeline it certainly does not take long for it to enter into the property through the toilets, drains, and even the water faucets. Exposure to raw sewage and wastewater poses a severe health hazard to both humans and pets and should be avoided at all costs. 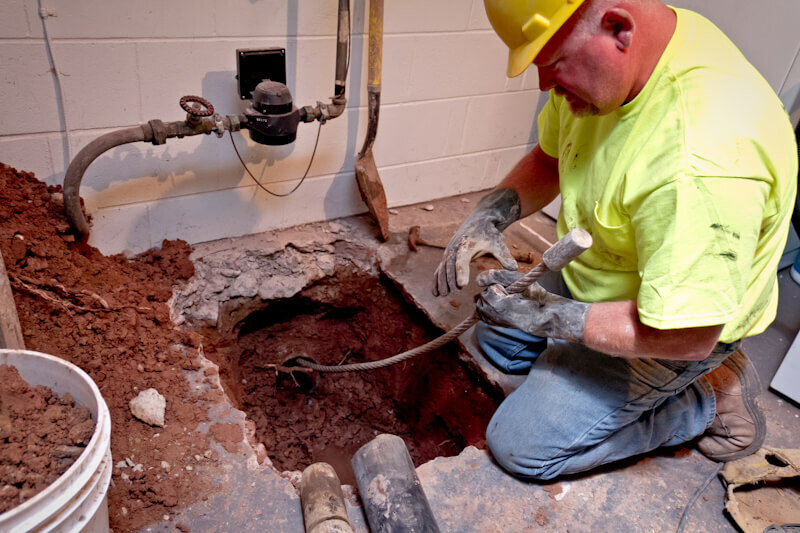 There are a few methods that plumbing contractors use in order to fix the sewer pipeline. The traditional excavation method has been around for many years. It requires the plumber to dig a large trench along the sewer pipeline in order to expose it for repair. Although this method does fix the sewer pipeline it is expensive, destructive, and takes a long time to complete. The large excavation equipment used to dig the trench is costly to run and operate. The trench itself destroys everything and anything in its path. Sewer pipelines are typically buried under lawns, flowerbeds, trees, bushes, patios, driveways, walkways, and parking lots. That means they are literally bulldozed over when the trench is excavated. Once the repair job is complete, which can take several weeks the plumbing company is responsible for filling in the trench. They are not responsible for repairing or replacing the landscaping and hardscaping. That is up to the property owner and adds onto both the expense and timeframe of the job. The good news is that there is a far superior process available to property owners in Norman, Oklahoma. Trenchless sewer repair has been available in the area for the past fifteen years or so. It does not require the excavation of a large and destructive trench. Instead, a small access point is made at one end of the sewer pipeline. A high-tech machine uses the access point to push an epoxy resin liner into the existing sewer pipeline. The epoxy resin cures in place to form an impenetrable liner or pipe within a pipe. The liner seals any cracks, rust spots, and small breaks. It also prevents future damage from occurring. Trenchless pipe lining is approximately fifty percent less expensive than traditional sewer repair and takes as little as one day to install from start to finish and will also last for a minimum of fifty years. That being said, not all trenchless pipelining processes are created equal. Nu Drain by Nu Flow Technologies incorporates the use of the best epoxy resin materials, and most technologically advanced equipment in the plumbing industry. If you are currently experiencing an issue with the sewer system at your property please contact Nu Flow Technologies for a free estimate. We are here to help you.